If you are looking to add a Siberian Husky Puppy or Adult to your family, please check out the list of breeders in Alberta and Saskatchewan listed below! The kennels listed here are all members in good standing of both the SHCC and the CKC, however, we are not responsible for any of the content therein. Anyone visiting the websites for these kennels must do their own research and use their own discretion in choosing a breeder. Kayla. Photo property of Hal and Sandy Smith. Visit the Siberian Husky Club of Canada's list of Breeders for a complete list of breeders across Canada. To see your Kennel name here, simply Become a Member or if you are already a member, contact the Webmaster. Ads on this page and in our club pamphlet are free to Members in good standing of the CKC and SHCC. We reserve the right to add or remove links from this website at any time, at the discretion of the Club Executive. 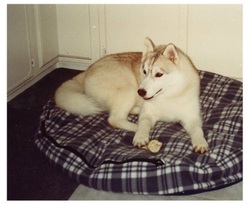 All photos are the property of members of the Siberian Husky Club of Canada, used with permission by the SHCC. All content on this website including photos is copyright and cannot be used without written permission of the owner. Website Design by Janelle Mahe, Coldfire Reg'd Siberians, 2012.